KARTET 2019 Hall Ticket:- The School Education of Karnataka has been announce the KARTET Hall Ticket 2019. The Karnataka Teacher Recruitment Board conducted the KARTET Written Exam on 3rd Feb 2019. Participators who have successfully apply their online form before 25th Dec, Only they can appear in the Karnataka TET Exam 2018-19. For the newest updates, you have regularly visited here. The Teacher Recruitment Board, Karnataka has released the KARTET 2019 Hall Ticket for the written exam of Karnataka Teacher Eligibility Test. The Govt of Karnataka had notified to conduct the KARTET 2018-19 Written Exam on 3rd Feb 2019. The authority announce the KARTET 2019 Admit Card before 10 days from the exam. We have provide here the official link by which you can easily download your KARTET Hall Ticket 2019. The Department official release the KARTET Exam Date. Applicants may access his/her KARTET 2018-19 Call Letter from the official page and appear in the Entrance Examination at the provide examination center. The Hall Ticket is mandatory document to appear in the KARTET Examination Center. Candidates who have valid KARTET Admit Card 2019 can enter in the examination hall and attempt the written exam. The Govt of Karnataka soon releases the KARTET Hall Ticket 2019 online mode. There will be no other option to download Karnataka TET 2019 Admit Card. We have suggest that after the downloading the KARTET Admit Card, You have read the full instructions also. KARTET Exam Pattern carries the information i.e. Question Patterns, Paper Mode, Exam Duration, Number of Questions, Marking Pattern and other. Therefore Candidates implement exam pattern while exam study. It can make the study easy and effective. The KARTET Exam will be conduct through offline mode. There will be objective type 2 papers. Total 150 Questions in each papers. Total 150 Minutes for each questions. The KARTET Exam Medium will be English, Kannada, Urdu, Hindi, Tamil, Telugu, and Marathi etc. Paper 1 has Child Development & Pedagogy (30 Marks), Language 1 (30 Marks), Language 2 (30 Marks), Math (30 Marks), EVS (30 Marks). Paper 2 has Child Development & Pedagogy (30 Marks), Language 1 (30 Marks), Language 2 (30 Marks), Math & Science (60 Marks) or, Social Science (60 Marks). The KARTET 2019 Hall Ticket uploaded now. Participators can not enroll in this exam without KARTET Hall Ticket. So If you want to be Teacher in Karnataka then you have required to qualify the KARTET Written exam. 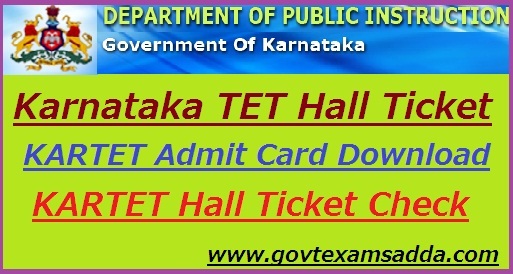 The department announce Karnataka TET 2019 Admit Card. You can access your KARTET Call Letter through the board’s home page. We have uploaded here a direct link after official declaration. Applicants must visit the Karnataka School Education official site. Now find KARTET 2018-19 Admit Card link on the home page. Enter required info in it like registration no., D.O.B etc. Your KARTET Hall Ticket 2019 will appear on your screen. Contenders are ready to download their Karnataka TET 2019 Admit Card. They also carry the User ID & Password during the downloading of KARTET Hall Ticket 2019. If you have facing problem to access Karnataka TET Hall Ticket 2019 then they can contact in board or comment us. Our experts will give you a proper solution.